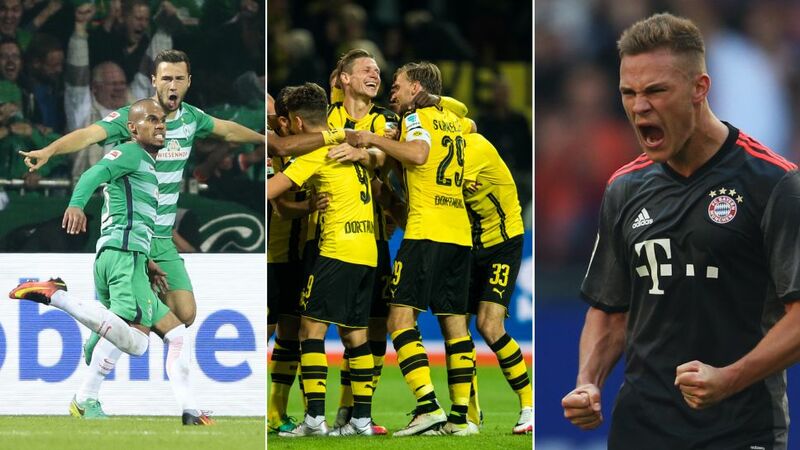 There was drama aplenty on Bundesliga Matchday 5, as Bremen, Dortmund and Bayern (from left) all won. Another pair of star turns from Mexican duo Marco Fabian and Javier 'Chicharito' Hernandez ensured the pinatas are still out in the Bundesliga. Fabian has been in a class of his own since registering a goal and an assist in the Matchday 3 win over Bayer 04 and, after laying on another goal in the midweek win in Ingolstadt, the 27-year-old was at his influential best as the Eagles rescued a 3-3 draw in a thrilling contest with Hertha Berlin on Saturday. Chicharito outdid his good friend on this particular occasion, however, seeing Fabian's smart assist and raising it with a match-winning hat-trick at 1. FSV Mainz 05's OPEL Arena. Viva la Fiesta! Borussia Dortmund continued their incredible scoring run in a slick 3-1 win at home to promoted SC Freiburg. BVB have now found the net an eye-watering 20 times in their last four matches in all competitions, playing at times with a clear nod to Pep Guardiola's former FC Barcelona pass masters. The new recruits - Ousmane Dembele et al. - are all thriving as part of Thomas Tuchel's high-octane take on tiki-taka football in a Dortmund side that look every bit contenders on all three fronts. They are the last team anyone in Europe wants to play right now, but someone has to - as early as Tuesday night as it happens, with that particular honour going to UEFA Champions League holders Real Madrid CF. FC Bayern München did not score anywhere near as highly in the flair department as Dortmund, but the defending champions took top marks for effort in their workmanlike 1-0 win at Hamburger SV's Volksparkstadion. Carlo Ancelotti's charges were far from their free-flowing best and needed a moment of genius from Thiago Alcantara to get over the line with their 100 per cent winning start to the campaign intact. The Spaniard's inventive pass unpicked the Hamburg lock three minutes from normal time, with Franck Ribery teeing up Joshua Kimmich for the only goal of the game. It does not matter who plays or who scores, Bayern's class of 2016/17 cannot stop winning. The drama did not stop there. After Robert Bauer put a Jannes Horn cross through his own net with 21 minutes of normal time remaining in the Saturday evening game at the white-hot Weser Stadium, it looked like being another one of those days for SV Werder Bremen. Die Werderaner had dominated VfL Wolfsburg prior to conceding the opening goal, but stuck to their task with a little help from their infectiously enthusiastic and aptly named 'Green-White Wonderwall'. Their persistence off paid when Lennart Thy smashed in an 86th-minute equaliser, before Theodor Gebre Selassie powered in Niklas Schmidt's injury-time corner to spark wild scenes of celebration in the Werder dugout and stands alike. At the fifth time of asking, on the back of four successive top-flight defeats, four-time Bundesliga champions Bremen are finally up and running. If you had asked anyone at the start of the season who would be among the Bundesliga's form teams early on, it is fair to that1. FC Köln and RB Leipzig would probably not have featured strongly. The former are more renowned for their defensive resilience, while Leipzig are newcomers at this level. Yet they have both been revelations so far in 2016/17, playing enterprising attacking football that is both appealing and successful. It was therefore no surprise that they shared the points in a 1-1 draw on Sunday, and given the stability with which both clubs are run, they should not be ruled out of the European reckoning yet.